Grimes with her dog Q. Since the release of her debut album in 2010, Grimes has set music journalists on a long-running tediously academic mission to define her sound. Is it pop? Alt pop? Electropop? Post pop? The dense and ethereal synth sounds and vocals are all over the map — some verging deep into experimental territory — but each of her four albums are coherent and compulsively listenable. Whatever it is, it’s made her a superstar. The way Grimes made her first three albums, however, was more important to the music world than the category of her sound. Geidi Primes (2010), Halfaxa (2010) and Visions (2012) were all produced and engineered solo using GarageBand, Apple’s entry-level music production software that is free with iPhones and Macs. Self-taught in GarageBand, she did not even think of herself as a musical artist when these albums were released. Recording and producing world-renowned albums in her bedroom was simply easier than the alternatives. “I’m not formally trained in music, so when I started translating thoughts to people it was basically impossible because I didn’t have the the vocabulary. I just started doing things myself." The career of Grimes is an example of how raw talent, creative energy, and technology can come together to give a musical voice to someone before they’re even sure (and before the critics are sure) of what kind of musician they are. Her rise would have been almost impossible 15 years ago. When I was making these sounds I was trying to make stuff that I would actually use. They don’t sound like anything I’ve made before. Grimes is one of the first artists to create a pack of her sounds for BLOCKS and NOISE. Made by ROLI, BLOCKS is a new music-making system that aims to make digital instruments totally approachable and flexible for learners, even as it’s powerful enough for professionals. It’s the approach that Apple took to music production software when they created GarageBand, which is now the most-used music production tool in the world. She wanted to make a BLOCKS soundpack, she says, because she could have used a few Blocks when she was on a shoestring budget teaching herself music in the Montreal underground scene. 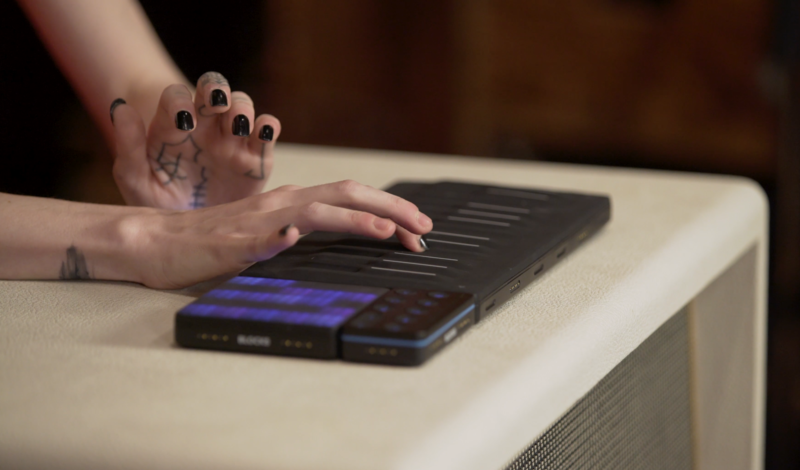 Grimes plays Electromagnetic Pulse on a Seaboard Block and a Lightpad Block. “The Seaboard Block is affordable, but it’s also a really, really powerful tool. Just having a small, cheaper MIDI controller that has so much more power than the average MIDI controller, that’s going to be really good for music. It took me a long time before I had access to something like this. My first MPC-esque instrument was a drum machine that was really expensive and that I was stressed about taking out of the house. It took me three albums before I got a drum machine. As a producer I thought it really stunted my ability to grow, that I didn’t have access to all these MIDI controllers. Electromagnetic Pulse by Grimes captures her signature sound in the sense that it is eclectically synthy, impossible to pin down, weirdly compelling, and defiantly future-facing. The soundpack does not look to the past and channel the drums or synths of Visions or Art Angels (2015). Instead, it’s a sketch of what Grimes may do next. Electromagnetic Pulse is available now in the NOISE app and free with BLOCKS. There is Stalingrad, an ominous bass that evokes an orchestra playing on the sidelines of the horrific battle. There’s Ocarina of Thyme, a delicate synth inspired by the Legend of Zelda. Talking Dog Bass reminds Grimes of Q, her dog. She wants producers to explore her sounds on BLOCKS. But she will be one of the main users of her own soundpack as she works on her newest projects. “Experimental” is another of the labels that is ascribed to Grimes’s work. It’s as imperfect as pop, in that few experimental musicians sell millions of records and headline festivals around the world. But when you see Grimes at work, it fits. She is a young, self-taught artist who experiments with new sounds and new technologies. She wants to push forward to something new. Nothing is set, and everything is changing — indeed each new work rejects attempts to categorize her. The thrill of truly experimental music — for both the artist and the fans — is that no one quite knows what is coming next. Electromagnetic Pulse by Grimes is free with every purchase of a Seaboard Block or Lightpad Block by ROLI. Or get the soundpack for $6.99 (€6.99, £6.99) in NOISE — the free music-making app that powers BLOCKS. Preview the sounds of Grimes' exclusive soundpack below, along with many more soundpacks available in NOISE. Learn more at ROLI.com.